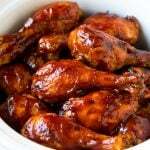 These slow cooker chicken drumsticks are coated in a spice rub and barbecue sauce, then cooked to tender perfection in the crock pot. A super easy 3 ingredient dinner option that takes just minutes to assemble. I’m all about my slow cooker these days, I’m constantly making teriyaki chicken and beef stroganoff. 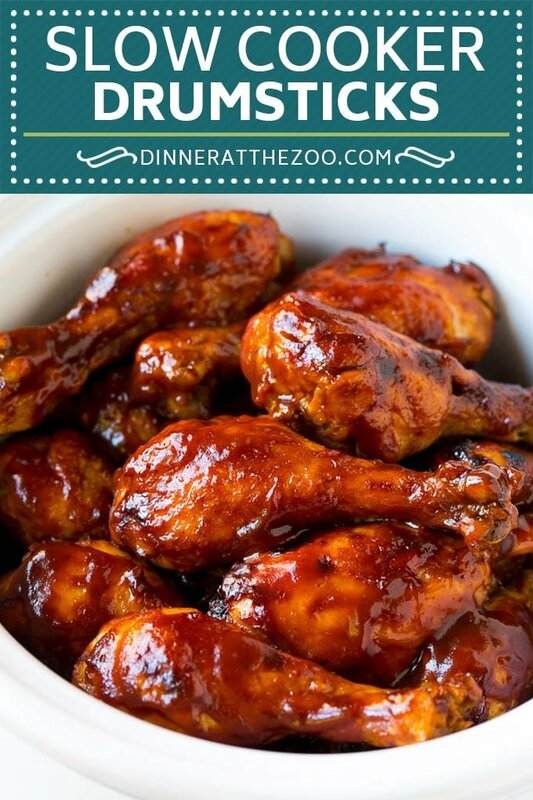 This chicken drumstick recipe is so simple, yet so very satisfying and it’s kid friendly too! In my opinion, chicken drumsticks are an underutilized cut of meat. 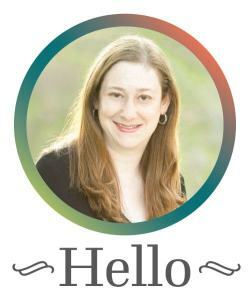 They’re inexpensive, widely available, flavorful and super kid friendly. 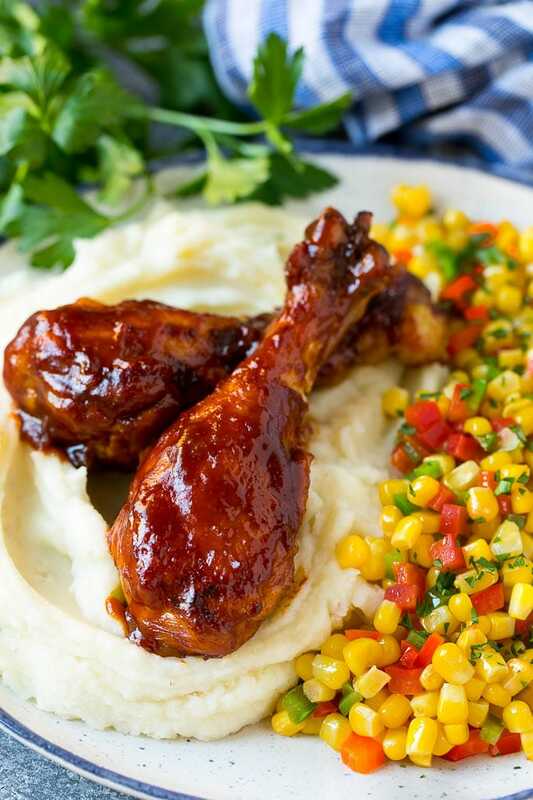 It doesn’t get any easier than these slow cooker chicken drumsticks – 3 ingredients in a crock pot and you’re ready to go! How do you make slow cooker chicken drumsticks? 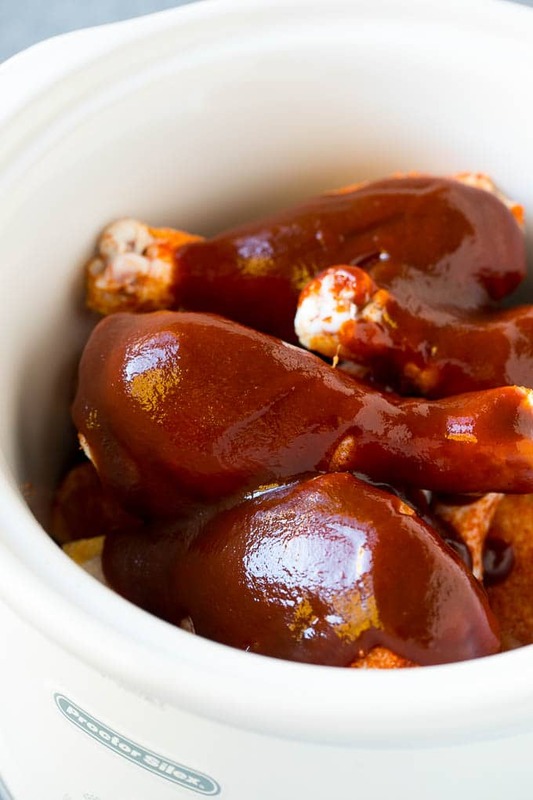 For this recipe, you’ll need chicken drumsticks, BBQ spice rub and your favorite BBQ sauce. That’s it! The drumsticks are coated with seasoning then the sauce is poured over the top. The final step is to brush a little extra sauce onto the chicken and broil it to crispy perfection. Can you put frozen drumsticks in a crock pot? Yes, you can use frozen chicken drumsticks in this recipe. Just be aware that the spice rub won’t stick as well to frozen meat! If you’re using frozen chicken, you’ll want to cook it on low for 8-9 hours or on high for 4-5 hours. I like to use my homemade BBQ spice rub in this recipe, but your favorite store bought spice rub will also work fine. I also have an amazing recipe for homemade BBQ sauce! Don’t have time to make your own? Use your favorite store bought sauce instead. Leave the skin on your drumsticks, the skin helps to keep the meat from drying out. Watch your chicken carefully under the broiler! You want to crisp up the edges a bit, but you don’t want your drumsticks to burn. You can also make this recipe with boneless skinless chicken thighs or breasts for a shredded BBQ chicken alternative. How long does it take to cook chicken drumsticks in a slow cooker? 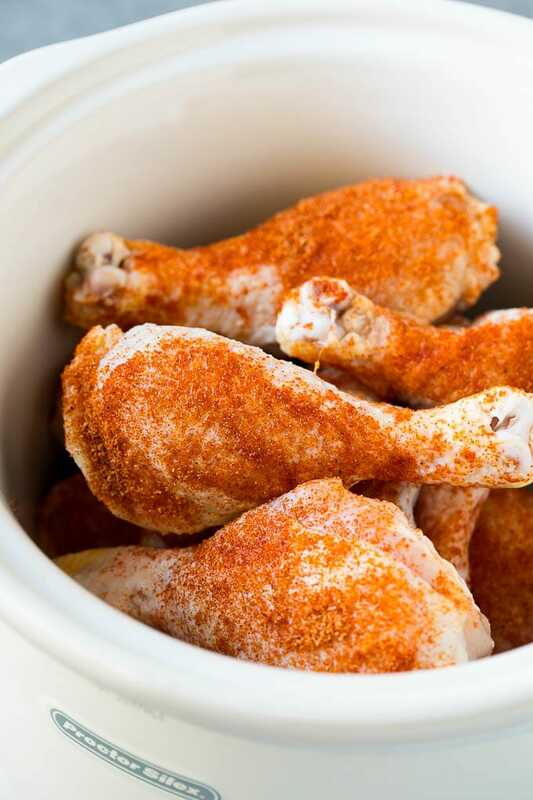 You’ll want to cook your chicken drumsticks on low for 5-6 hours or high for 3-4 hours. You’ll know when the chicken is done because it will be so tender that it will practically fall off the bone! This is a simple recipe with a simple ingredient list, but you can add other flavorings into the mix to make this recipe your own! Spicy: Stir 1 chopped chipotle pepper in adobo sauce into the barbecue sauce before you pour it into the slow cooker. Garlic Lovers: Add 2 teaspoons minced fresh garlic to the crock pot. 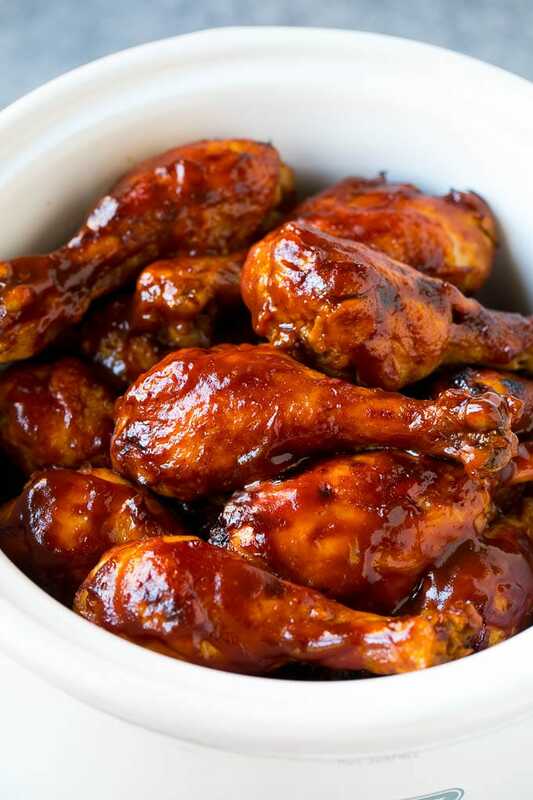 Sweet and Tangy: Add 2 tablespoons brown sugar to the barbecue sauce before you pour it into the slow cooker. I like to serve my crock pot drumsticks over mashed potatoes or another starch such as rice. I also include a veggie on the side. Here are some of my favorite side dish options. 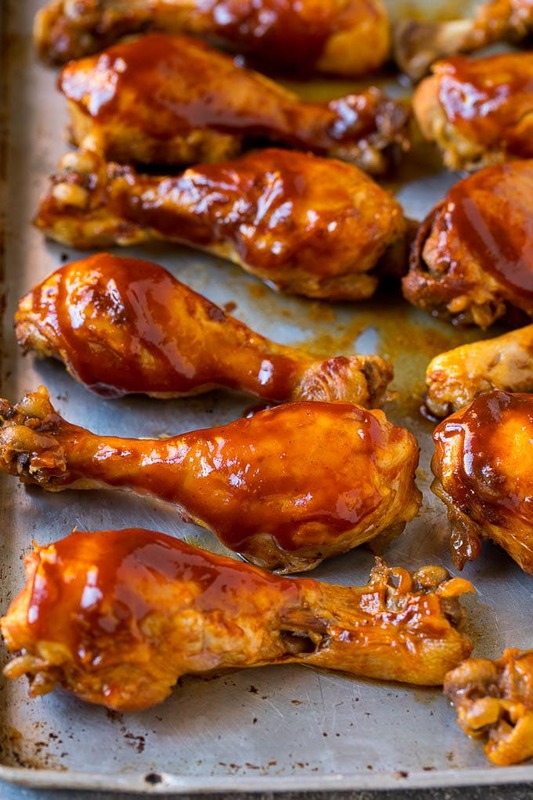 Once you try these drumsticks, you’ll find yourself making them all the time! It’s so easy to keep the ingredients on hand for when you need to assemble dinner in a hurry. There’s only 5 minutes of prep time and the crock pot does the rest of the work! May I know what temp to broil the drumsticks? Broil means top heat baking in the oven correct? Thanks! Broil is the top heat in the oven, for my oven it’s 500 degrees. These look AMAZING! I can almost smell and taste them through the screen! And I love that this is an inexpensive and easy recipe – it would be great for upcoming parties! I don’t make drumsticks OR use my slow cooker enough and I know my husband would LOVE these, so I need to add them to my meal plan ASAP! These chicken drumsticks look mouthwateringly delicious! I am definitely going to have to try these in the slow cooker. Yes, what a fantastic recipe that the whole family will love!! Chicken drumsticks are so high in protein and delicious and your photos make them look extremely tasty!! I look forward to giving these a go!! Thanks for sharing. Can you skip the broiler and eat the chicken right from the crock pot? Yes that’s fine, they just wont be crispy! I am going to use this drumstick recipe this week. It looks delicious and so easy to make!